Pope John Paul II seriously thought about resigning due to ill health in 2000, five years before he died, his private secretary has revealed. Stanislaw Dziwisz said the Pope also contemplated changing Church law so that pontiffs would retire at 80. Cardinal Dziwisz makes the claims in a book about his four decades serving as the Pope's personal aide, due to be published next month. 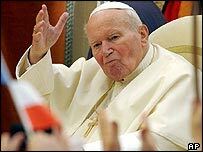 Pope John Paul II died in early April 2005, at the age of 84. There were some suggestions after his death last year that Pope John Paul II had mulled standing down in 2000, but eventually decided that he would remain Pope for as long as God willed it. But the latest claim comes from one of his closest aides, a Polish priest who worked as his personal secretary for 40 years. Cardinal Dziwisz's book A Life with Karol - which uses Pope John Paul II's first name in its title - also reveals that the Pope weighed altering the laws of the Roman Catholic Church to enable pontiffs to stand down at 80 rather than serving until death. The BBC's David Willey in Rome says that the memoirs, written by the man who became the Pope's gatekeeper in his latter years as his health failed him, gives an unusually intimate portrait of the man, revealing fascinating new details of John Paul II's opinions, hopes and fears at various critical times in his long papacy. The book, to be published in February, says that both the cardinal and the late Pope were convinced that the former Soviet Union was behind the 1981 attempt on the John Paul II's life. Cardinal Dziwisz provides no hard evidence as to how they reached this conclusion, but writes that "all roads lead back to the Soviet KGB". Although Moscow has denied involvement in the assassination attempt, Cardinal Dziwisz says the Pope, a vocal supporter of Poland's Solidarity union, was seen as a threat to Soviet power. Turkish gunman Mehmet Ali Agca shot the Pope while he was driving through St Peter's Square, with Cardinal Dziwisz at his side inside the jeep. "He was sent by those who thought the Pope was dangerous, inconvenient, by those who feared him," Cardinal Dziwisz writes.